Visiting Bryce Canyon is always a wonderful experience no matter if you are planning just a day trip or camping. One of the more exciting and sought out activities in Bryce is backpacking through the rugged backcountry, many people choose to do this to avoid the tourist congestion. 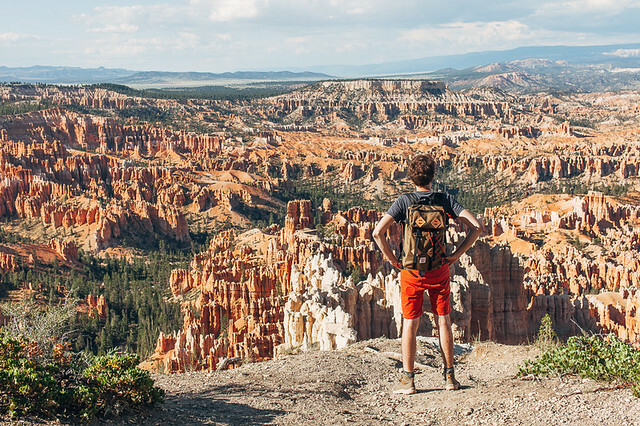 Choosing to backpack through Bryce will give you views, experiences and solitude that you would not otherwise find choosing to just hike the more busy and used trails. When backpacking Bryce Canyon you will need to pay a backcountry fee of $5 a person. Not a steep price to explore part of the United States most scenic landscapes! Explore areas that are mostly off limits, with towering hoodoos, meadows, forests and more! Most who visit Bryce Canyon forget to take the option of exploring the backcountry and end up doing the more touristy, compacted hikes. Which is fine and all, but can be frustrating for those with a little more experience in hiking. Under The Rim Trail – This trail is approximately 22.9 miles long and takes you from Bryce Point to Rainbow Point. Riggs Spring Loop – This is an 8.6 mile hike that ends and begins at either Rainbow Point or Yovimpa. Backcountry is a little more rigorous and requires some experience, but beginners will do fine. Make sure to pack plenty of water as well as first aid. Enjoy the beautiful backcountry of Bryce Canyon!